Go to the download page to see what is new. Mid-capture commands so you don't have to stop and start over again. Check out our scrolling photo screen-saver, with Flickr interface! With the rest of your desktop shaded, your desired capture region stands out clearly. Why redraw the same box over and over when you are capturing the same part of your screen ? AndySnap remembers your previous capture regions to keep you moving forward with your task, and to give you the exact same screen area every time. Get the outline of the currently active window, or the entire desktop, with just one key press. AndySnap automatically increments the file names in your image stream, but sometimes a certain screen capture needs a special name. Just press F during your capture to temporarily, or permanently, override the automatic filename. AndySnap captures menus easily, and it can also show you your mouse cursor as well. The built-in mini-viewer can quickly show the last capture you made, and all of the other images in your capture stream. You can also delete images from the viewer by right-clicking on the images. 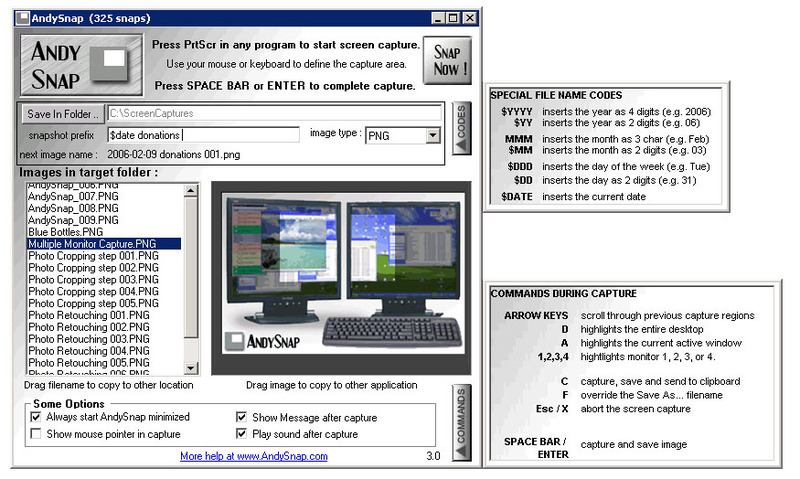 AndySnap supports and spans multiple monitor configurations (enabled using extended desktop) of 2, 3, or even 4 monitors. AndySnap supports the use of special date codes that automatically insert the day, month, year or full date into the file name of your screen capture.